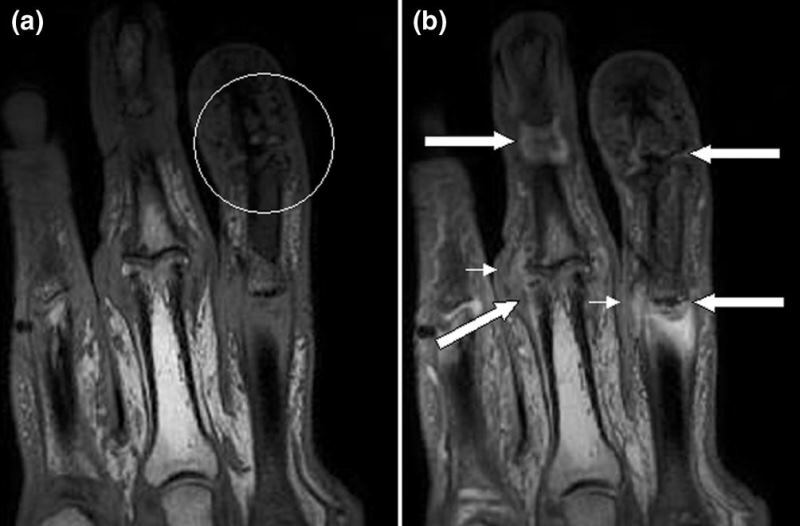 Magnetic resonance images of fingers in psoriatic arthritis. Credit: Fiona McQueen, Marissa Lassere and Mikkel Østergaard. Eli Lilly and Company (Lilly) has reported positive top-line results from the Phase IIIb/IV SPIRIT-H2H study of Taltz in comparison with humira (adalimumab) to treat patients with active psoriatic arthritis (PsA) who are biologic disease-modifying anti-rheumatic drug (DMARD)-naive. The head-to-head (H2H), multicentre, parallel-group study evaluated the efficacy and safety of taltz against humira. Results showed that the randomised, open-label trial met its primary and all major secondary endpoints. Patients treated with taltz met the trial’s primary endpoint at 24 weeks, achieving improved signs and symptoms of active PsA compared to humira as assessed by the proportion of patients simultaneously achieving at least a 50% reduction in disease activity. These subjects also experienced complete skin clearance as measured by the Psoriasis Area and Severity Index (PASI100). The safety profile of taltz was also found to be consistent with those reported earlier. No new safety signals were observed during the SPIRIT-H2H study. Lilly immunology development vice-president Lotus Mallbris said: “The positive results from the SPIRIT-H2H trial reinforce that taltz effectively treats the debilitating joint signs and symptoms of active psoriatic arthritis, while also providing skin clearance. Lilly enrolled a total of 566 active PsA patients as part of the SPIRIT-H2H study. Patients were randomised to receive 160mg and 80mg taltz or 40mg humira for a total of 52 weeks. Primary analysis was carried out at 24 weeks. The trial’s major secondary endpoints were non-inferiority in ACR50 and superiority in PASI100 in taltz compared to humira.